I’ve always thought of reverie as living inside a daydream. 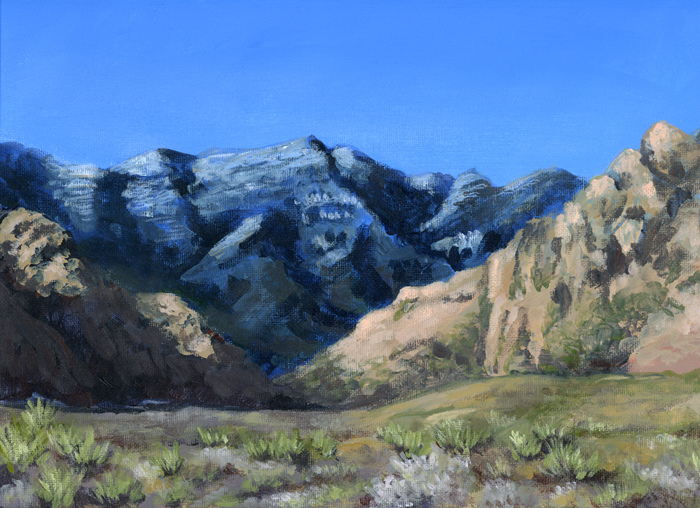 When I’m painting, that’s where I exist – and I LOVE IT! 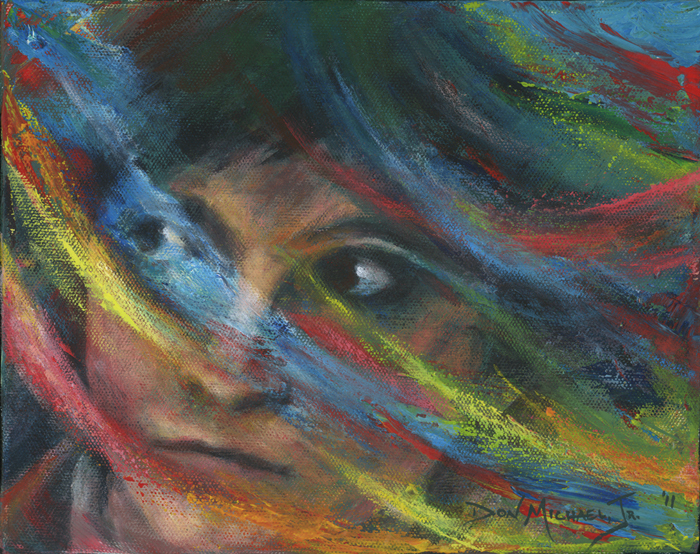 The Under-Schmeerings for Reverie were created during the painting of Lupti-Lu this past December. Below is the before/after. 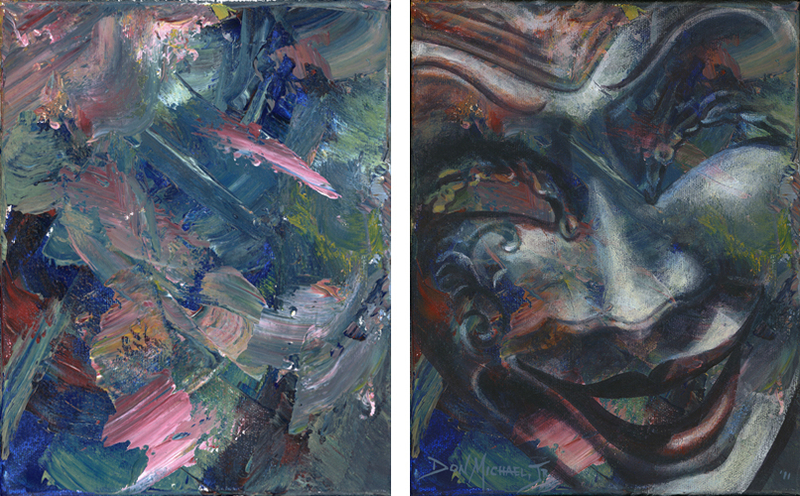 I find it fascinating how the exact same palette can look so different between paintings. As you can see below, Lupti-Lu’s colors look nothing like what you see above. 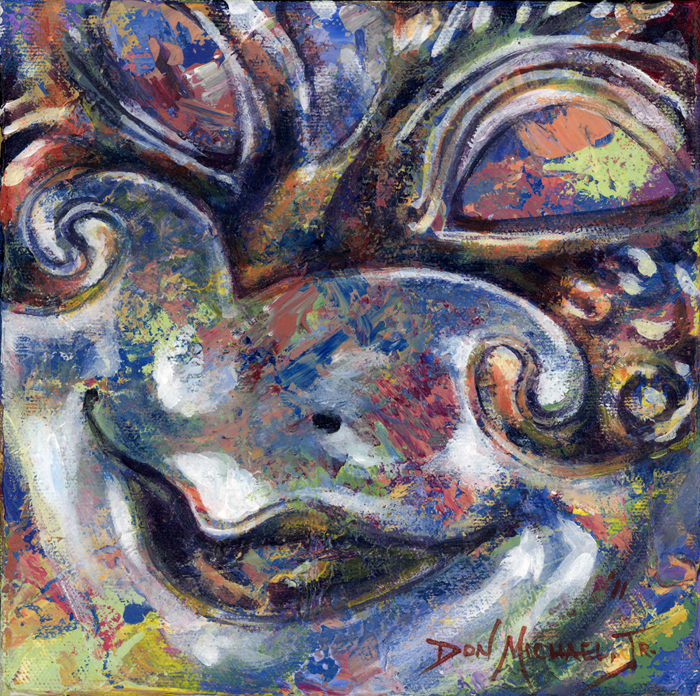 If you’re interested the palette for both consists of Phthalocyanine Blue (Green Shade), Yellow Oxide, Cadmium Red Deep Hue, and Titanium White – all from Liquitex. 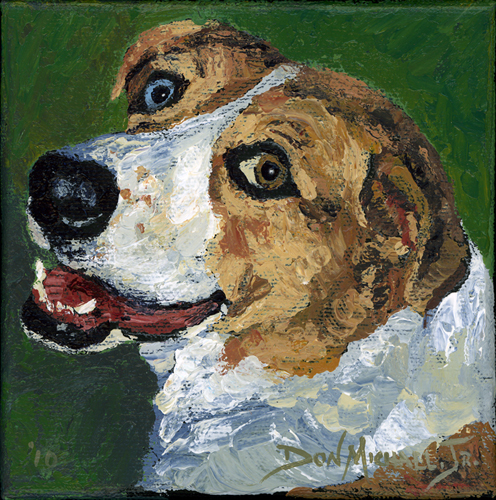 Lupti-Lu – 5″x5″ – Acrylic on canvas – ©2010, Don Michael, Jr. I really enjoy the way my Over the Under-Schmeerings paintings seem to add an atmosphere of mystery to the subject matter. They give an object that is interesting in its own right an added sense of mystique. 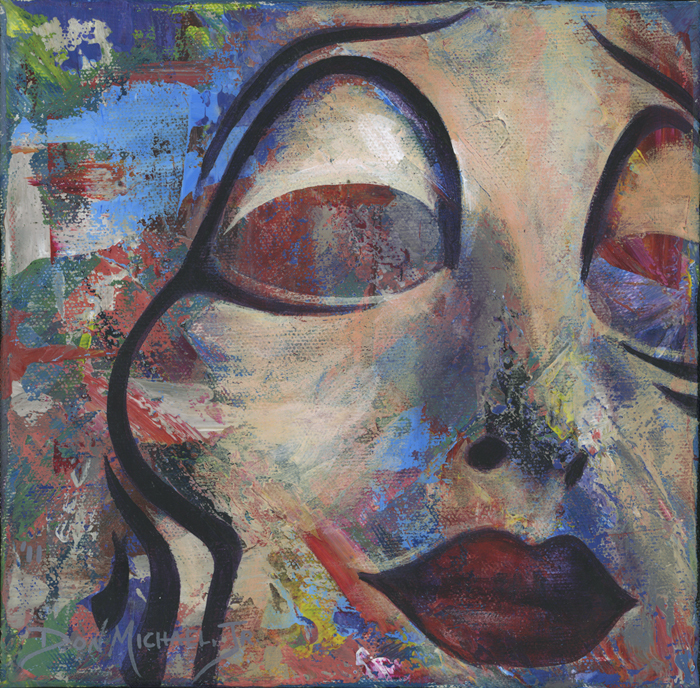 This mask from the Cirque show “O” has become one of my favorites, with this being the 5th time she’s shown up on canvas. This time she shows up atop the schmeerings that were created during the painting of both Delight and Beer-Thirty. 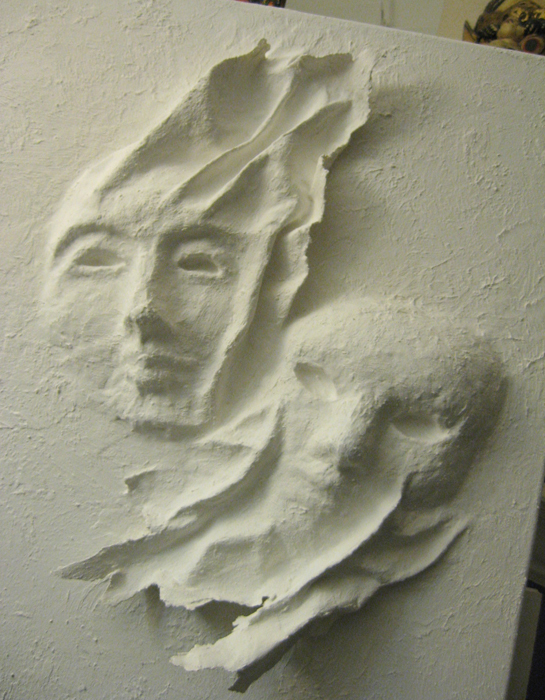 Earlier this week I posted about my little foray into an artistic existential crisis. Sometimes just getting something off your chest is the best medicine – and this proved to be true once again. It was even a bigger help to receive all your wonderful comments. As Robin wrote, “…this is a wonderful, supportive place for all of us to share and grow…”. I concur. Thank you all. So, I just nosed my boat back into the current, put the oars away, and started going with the flow that was always there. Change will occur naturally. I don’t need to think so hard about it. 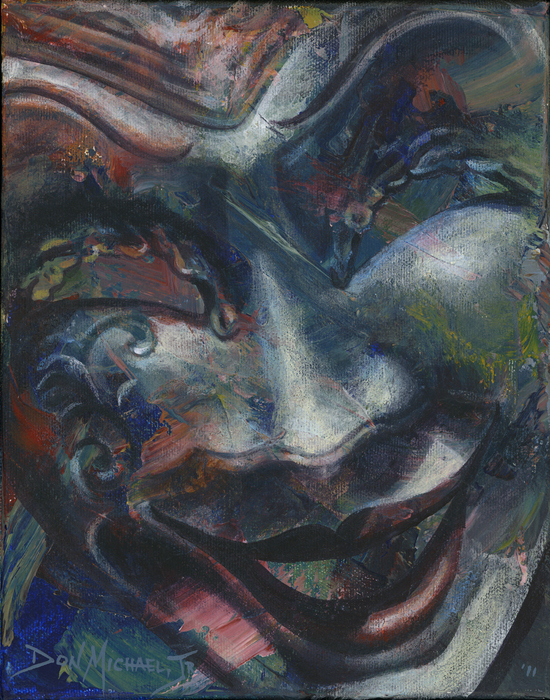 The Under-Schmeerings for Flux were created during the painting of Determined. (Does that seem pretty ironic to anyone else, or is it just me?) Below is the before/after. 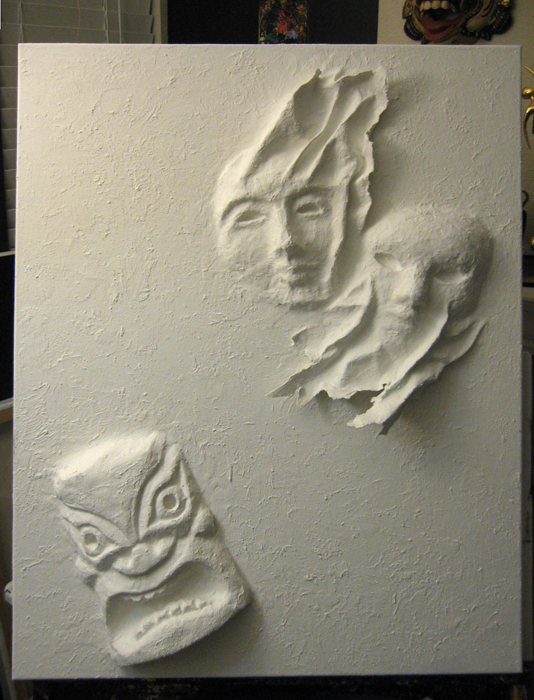 This was a hard Under-Schmeering to paint over because it had such a great composition as it was. However, that is not a new direction that I’m ready to follow… yet. Remember, never say never. Now that I’ve got my head back on straight it’s time for me to go teach this weekend’s Acrylic Workshop. 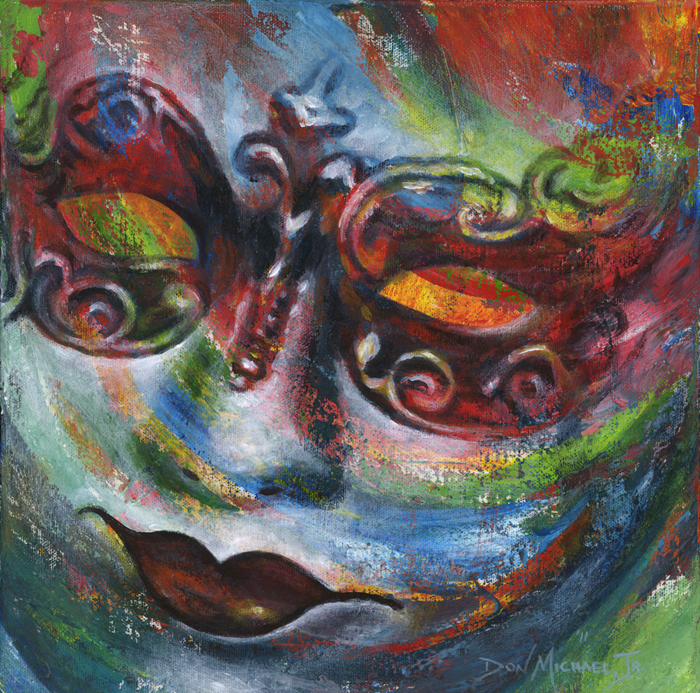 My brother, David, has written several short stories that were inspired by my mask paintings. 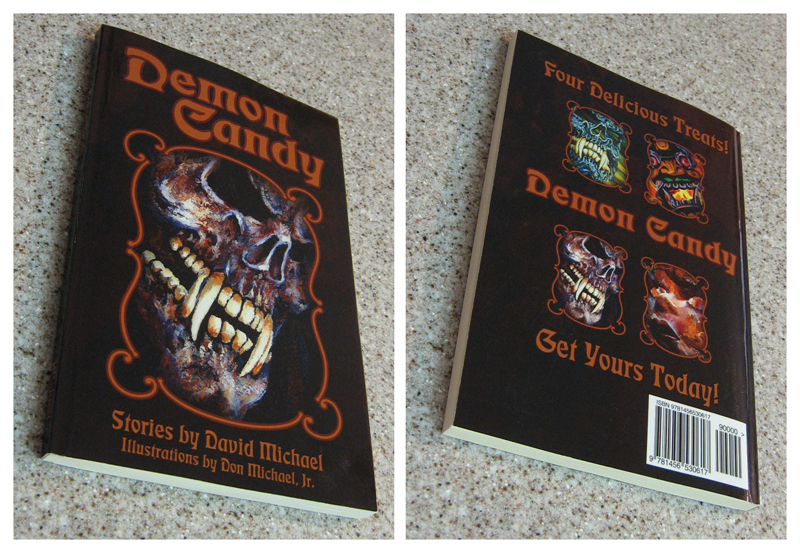 He has just released the book Demon Candy which includes four of these stories. His brief description of the book states, “Four linked stories of Hell, and Life, and Life in Hell”. 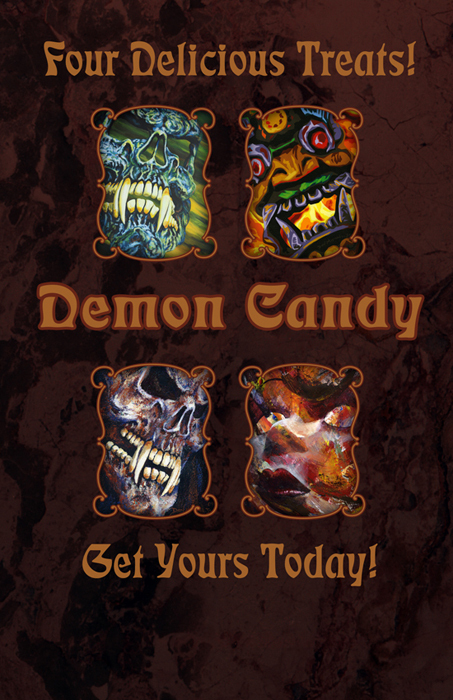 If you click on either of the next two images you’ll be taken to his blog which has a brief write-up about each of the stories as well as links to the book/e-book in its various incarnations. 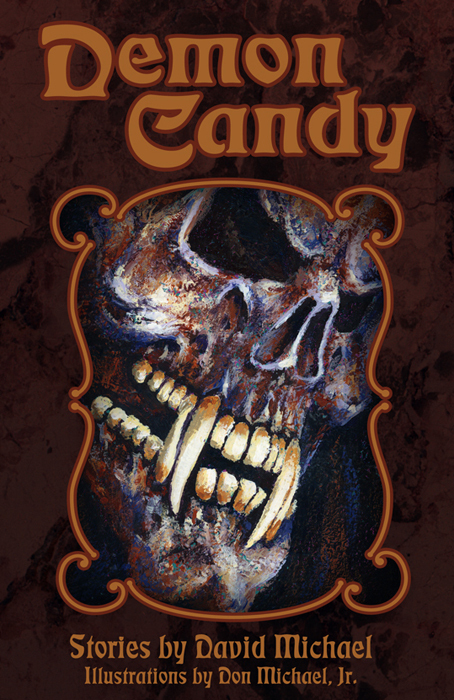 Demon Candy – Written by David Michael – Illustrated by Don Michael, Jr.
©2011, David Michael – ©2011, Don Michael, Jr. 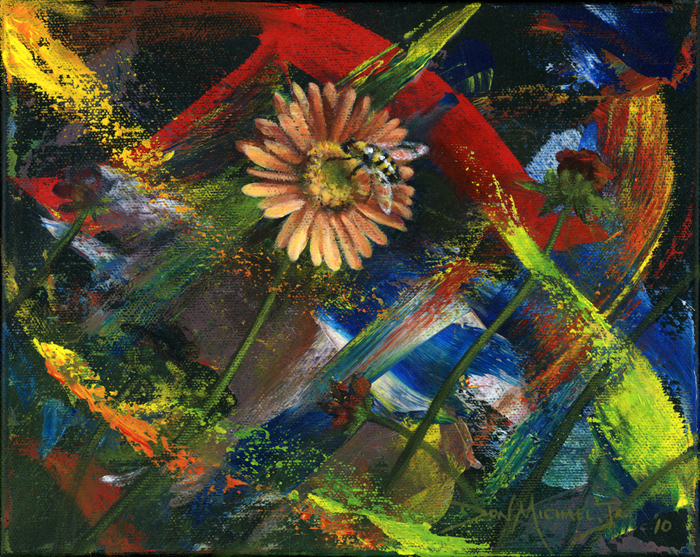 The four paintings used are clockwise from top: Summer Breeze, Inferno, Afterimage and Sweet Tooth. These stories are all great, but they are also pretty dark – so approach with caution. For those interested, my favorite story of the book is Afterimage. 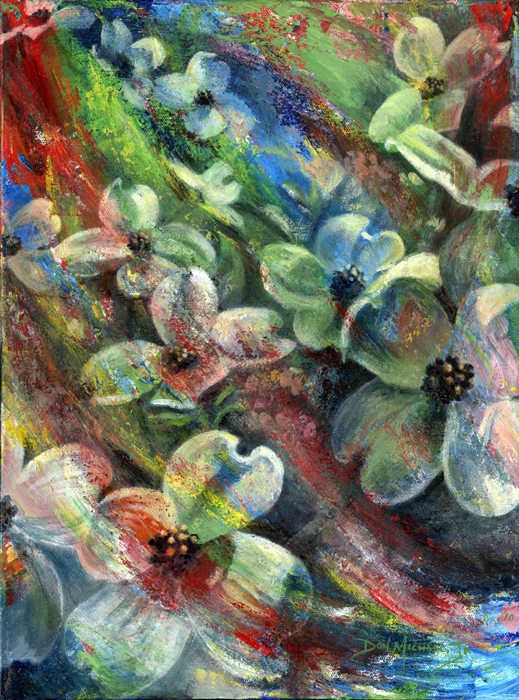 As these were drying I grabbed another of my experiments from last spring and attached it to a smaller canvas. I decided to center this one on a square canvas, which is much more bi-symmetrical than I am usually ready to deal with. To give an idea of his depth, I also shot him from a higher angle. I have no idea what I’m going to do next to either of these canvasses. They are both very much works-in-progress. But, at least I’m paddling again… maybe a sympathetic current will grab me soon. 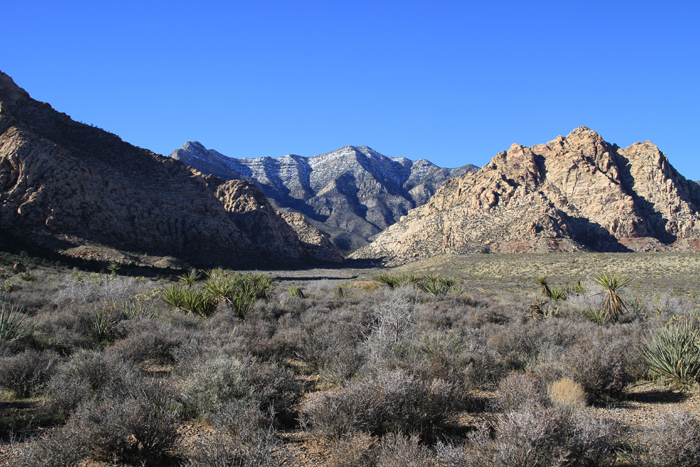 The image was provided by my friend, CJ, from some shots she took with her new camera (a Christmas gift to herself) at Red Rock Canyon a couple weeks ago. Thank you, CJ. I had two students in my class today, and we were able to work our way through the entire project quickly and in its entirety. I’m proud to say that both ladies did a GREAT job. I wish I had taken my camera so I could share their new masterpieces. What I love about this process is that even though we are painting from the same image with the same colors, and even though they are following along with me as we work through the project, each of our paintings come out so different and show a little of the personality of each of the students. Great job Elaine and Rachel! At least it’s not for me. Every word is a symphony. I must admit that emotionally I needed a bit of happy time. This past weekend I was deeply saddened, as was the rest of our nation, at the horrific event that occurred in Arizona. Now I am dealing with an intense anger as I watch idiots from all sides of the political spectrum use this as an opportunity to push forward their views and agendas while attacking each other. As is par for the course, the media is perpetuating this ad nauseam. The rhetoric is out of control and is very harmful. The issue here is not political, it’s humanity. A cold-blooded, cowardly killer plotted and carried out an attack on unarmed victims. Is he a product of out current political mess. Possibly. Is this an excuse. NO. I believe that the culpability and accountability in the act of an individual belong to that individual. I wish everyone would take a chill pill, join together to lift up these grieving families, and stop slinging mud at each other. Sorry, but I had to get that off my chest. 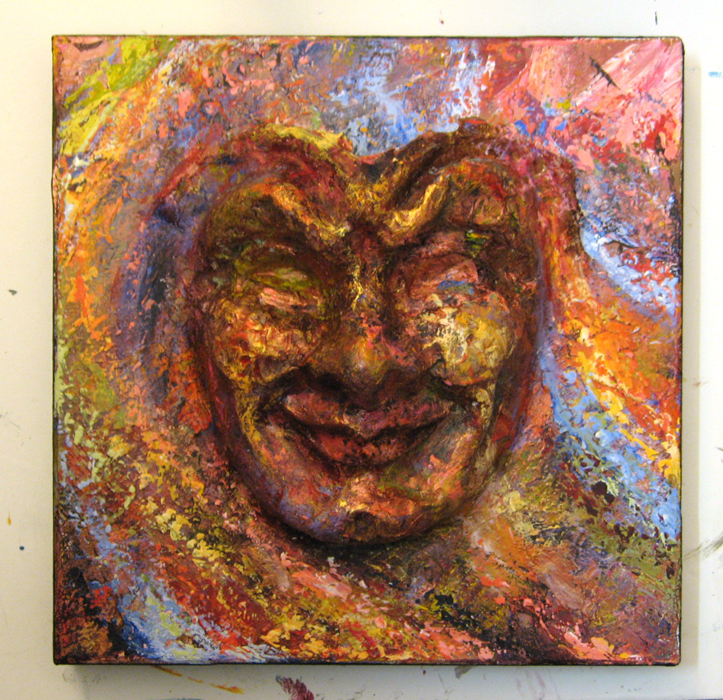 For Happy Thoughts I used the Under-Schmeerings created during the painting of Bright Side. I had to smile at the irony. Wednesday I had an interview with a former colleague of mine over lunch. Her name is Jochabel Reese and she is a freelance writer for AOL’s City Best. We met at Luca’s Cafe & Deli, where several of my paintings reside, and had a wonderful visit – mixed in with the business of the interview. If you would like to see the results of the interview, click here. I must admit that it’s a bit of a shock to see the rambling words that tumble out of my mouth transcribed directly. Thank goodness she had to keep the article under 500 words. I think I need to work on my interviewee skills… In all seriousness, thank you, Jochi! Meanwhile, I’ve been getting ready for the first First Friday of 2011, which will be going on tonight. 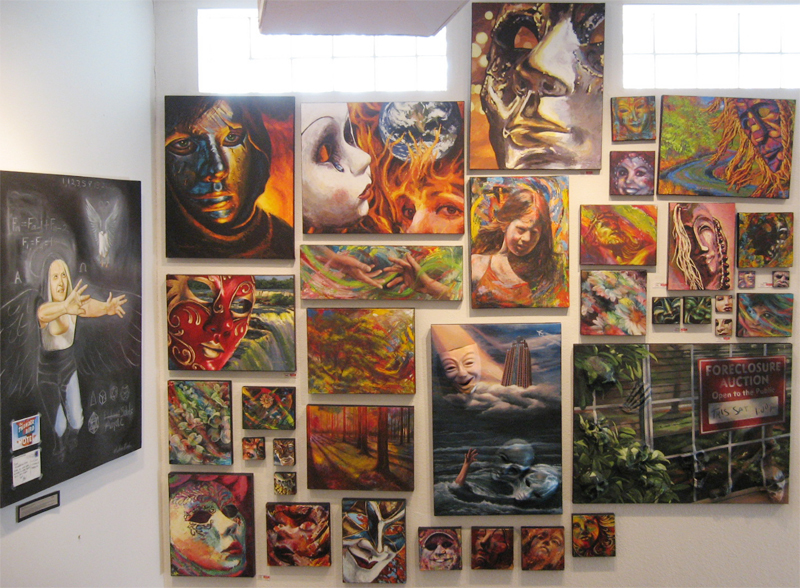 I decided to completely redo my wall in the Blue Sky Yoga Gallery, which required taking everything down on Wednesday and hanging an entirely different set of paintings on Thursday. Cheryl & Corey Slader – who run the gallery/yoga studio – were generous enough to repaint the wall for me during the interim. Below you can see how my wall looks now. I love how Montana Black’s painting seems to be reaching out to my work, so I kept it in the photo. (I wish I had taken note of the title, so I could refer to it. Sorry Montana.) I notice that I need to straighten up the paintings in the upper right corner. That’s what I get for being in such a hurry. The gap in the lower right corner is where I put my table of prints which is only up for First Friday. Nine of these paintings will be seen for the first time outside of my studio. I look forward to any conversations they may inspire. 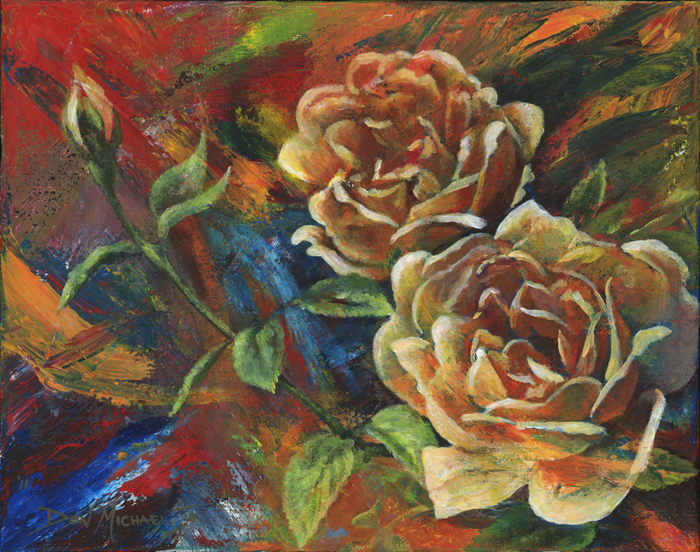 …and my painting Sanctuary will be going to Wormleysburg, Pennsylvania to hang in the Susquehanna International Fine Art Competition at the West Shore Gallery. 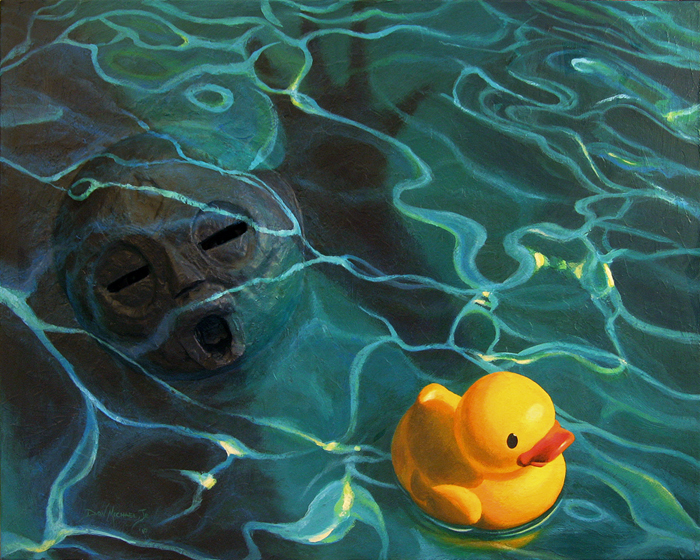 The theme of this show is “River Art” and will run from February 11th thru March 10th. 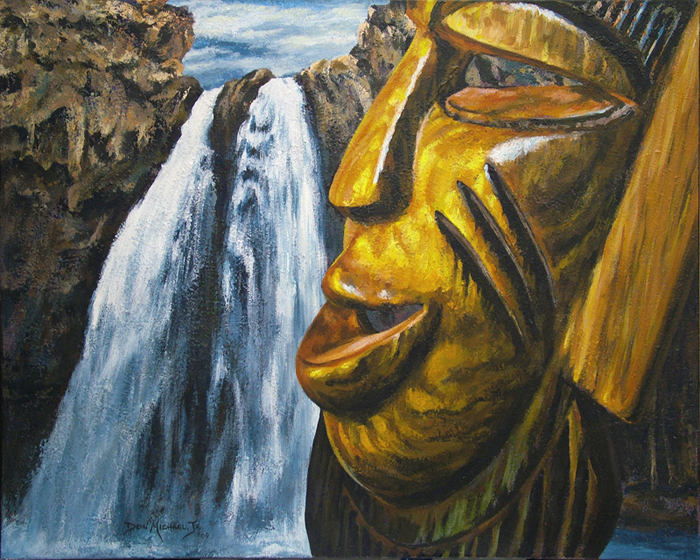 Sanctuary – 24″x30″ – Acrylic on canvas – ©2009, Don Michael, Jr.
I’ve also been working on a new book cover for my brother, David. I’m really excited about how it’s coming along and cannot wait to see it in print. 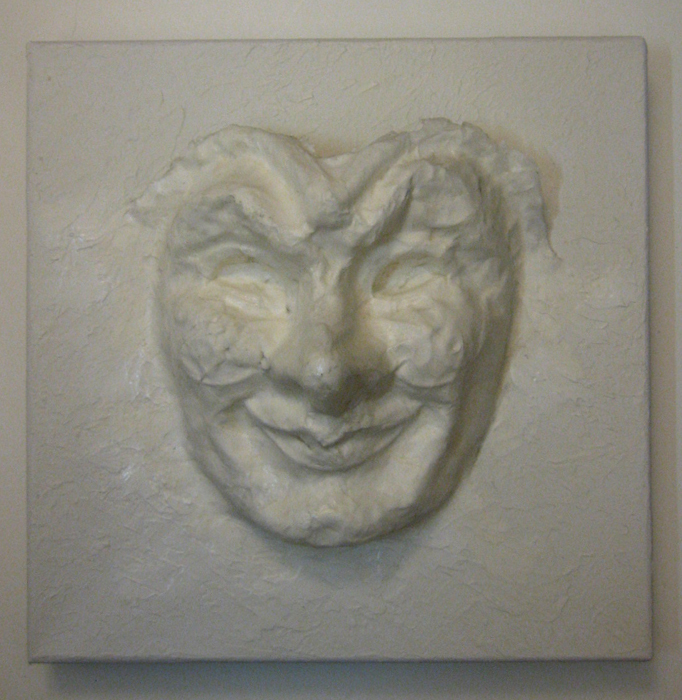 It’s a book of some of the short stories he wrote based on mask paintings I have done – with one of them being featured on the front cover. As I’m sure you fear, I will be blogging about it when it is released. Well, I guess I’d better quit blathering on about myself and get back to work. 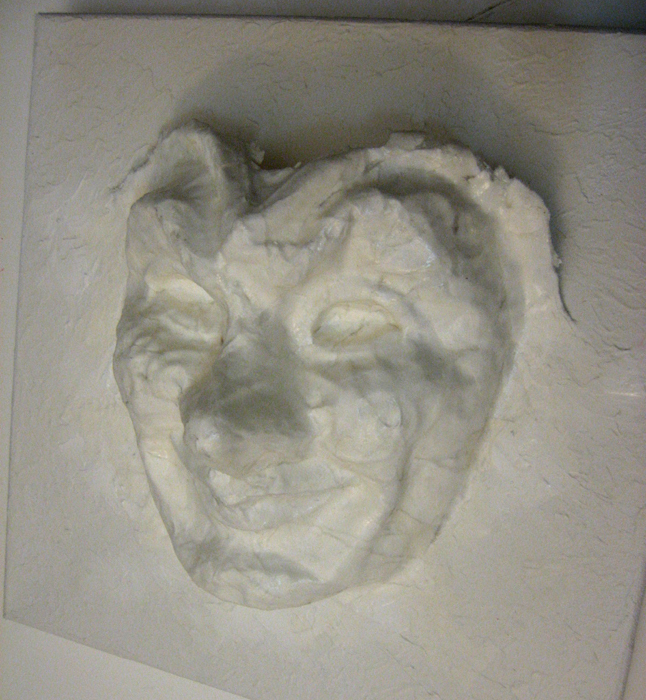 There’s still some painting that must occur… My boss insists. A few years ago a friend of mine asked me to scan some photos of her from her college days. One of the photos had her giving her professor a look that I thought was quite intriguing. Recently, as I was searching for subject matter for my Over the Under-Schmeerings series, that photo came to mind. It only took me a few minutes of digging around in my hard drive to come up with it. After cropping in tight on just her face I knew I had my composition. The original photo was black & white and I thought about just using the values to place the image into the schmeered background. 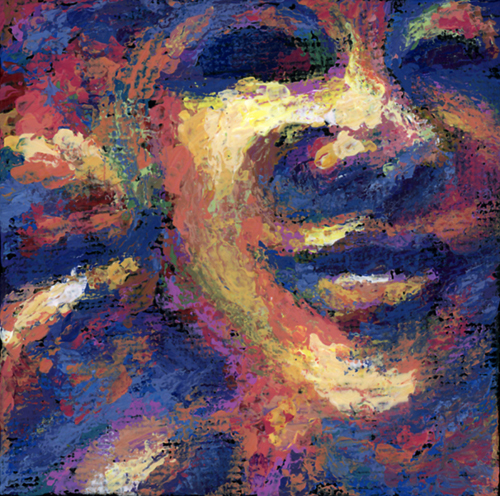 But, I decided I needed the warm flesh tones to keep the image from looking corpselike, since the original schmeering was predominantly blue and blue-green – as you can see below. In case your wondering, yes, I did let my friend know that I was about to post a painting that included her image. I guess you could call it an after-the-fact request for permission to use her visage. Thankfully she was game for it, and will probably see it sometime today – right here where you’re seeing it.